It's been a peace-filled six years. Everything completely perfect. No threat of evil is in the land of Hyrule. Times have never been better. Until now, that is. It's the Trinity festival, and Zelda has been getting bad dreams. Her young son, too. 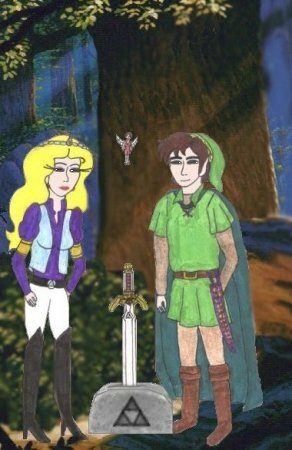 She suddenly fears for Hyrule, and knows that something, or someone is coming... Link is skeptical. Ganon is long gone, isn't he? And who else would want to threaten Hyrule? Three mysterious arrivals occur during the holiday. On Nayru's Day, a beauitful warrior, the Avatar arrives, supposedly banished from Sosaria, for reasons unknown. Prince Nick, taken through a portal years before, also returns. A few days later, a Gerudo woman warns Zelda that 'their King has returned'. Ganondorf is somehow back, and this time he's out to extract REAL revenge. He's also out to get the Avatar. One thing is for certain, he won't give up, until the Triforce is finally his... whatever it takes. This page was created by Juliet A. Singleton © 1999-2006. All rights reserved.